JIUQUAN, China-Business for wind and solar energy components has been so brisk in Gansu Province-a bone-bleaching sweep of gusty desert and sun-washed mountains in China’s northern region-that the New Energy Equipment Manufacturing Industry base, which employs 20,000 people, is a 24/7 operation. Just two years old, the expansive industrial manufacturing zone-located outside this ancient Silk Road city of 1 million-turns out turbines, blades, towers, controllers, software, and dozens of other components for a provincial wind industry already capable of generating more than 5,000 megawatts per year. Chen Xiao Yan, a 25-year-old assistant in the New Energy Industry office, said Sinovel, Goldwind, Dongfang, Sinomatech, and 21 other clean energy manufacturers have established plants at the base. Two of those developers also produce equipment for Gansu’s expanding solar photovoltaic industry, which at the end of this year will have 120 megawatts of electrical generating capacity. Northern Gansu is doing that and considerably more. As part of Circle of Blue’s new Choke Point: China project, I spent much of a week in Gansu reporting on alternative energy and water use. This region of dust and industrial innovation-about as far west from Beijing as Montana is from New York-has very quickly become a vital outpost in China’s rocket ride to the top of the global water-sipping clean energy heap. 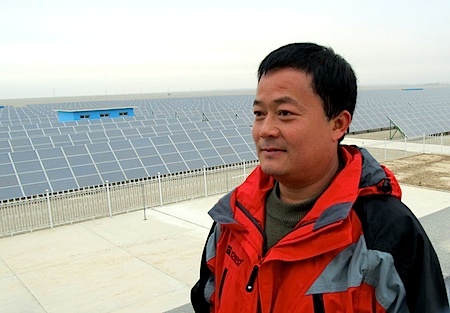 Prompted by a national decision in 2005 to diversify the nation’s energy production portfolio, and to do so with the goal of reducing water consumption and climate-changing carbon emissions, Gansu and its desert neighbors are pursuing clean energy development with a ferocity unrivaled now in the world. Along with northern Gansu, there are six other wind energy zones and eight other solar power zones being built in China-most of them in the desert regions of northern and western China. China also has a burst of seawater-cooled nuclear power plants under construction along its eastern coast. China’s National Energy Administration projects that, over the next decade, generating capacity from wind, solar, and nuclear power will more than quadruple, from 53 gigawatts in 2010 to 230 gigawatts in 2020. The other big non-carbon electrical producer is hydropower, which is expected by the government to grow to 400 GW of capacity by 2020, up from 213.4 GW last year. Yet China’s demand for electricity is rising so quickly that the massive investment in new generating technologies will not make nearly as large a dent in production-or in freshwater conservation-as many people might expect. Simply put: wind, solar, and nuclear power will climb to around 13 percent of the 1,900 GW of generating capacity expected by 2020, according to government data. That’s up from the nearly six percent of the 962 GW of generating capacity today. But China’s annual national water use-591 billion cubic meters in 2010-is anticipated to grow by 40 billion cubic meters by the end of the decade. And the increase in water use , a good portion of which is spurred by new coal production, is occurring in a nation that is steadily getting drier.